The fact that Marrakech is an oasis in the middle of nowhere is confirmed once you’ve left the metropolis. 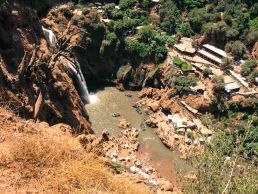 After two hours en route, the Ouzoud falls —the second bigger in Africa, according to the locals— arise surrounded by a valley that gives birth to yet another oasis. This time a green one. An ideal place to soak in water. Nonetheless, it’s 7:44 pm and after spending some time covered by the clouds, the thermometer dials 37º C. The water feels good in and out the body, given than the trip with a minibus, although fast —for Moroccans its easy to overtake and dodge whoever, whatever and whenever they want— is still tiring. The food, a salad base on tomatoes and vegetables and the ‘tagine’ —meat with vegetables —is still great but a bit repetitive. Always the same (good) food. The drop from the Ouzoud falls is more than 110 meters and, of course, spectacular. Sidi Kaouki is a vast beach located in the south of Essaouira. To access it, you have to cross a narrow one way road where trucks, taxis, vans and cars have to agree with sign language who is the one to abandon the asphalt. At the beach, families dominate the scene over some groups of friends that play football and a few tourists. They all share the space with camels, horses and dogs that play the role of hosts. A couple of old houses glued to a side of the beach is all there is to the set. Beyond hammocks and umbrellas there’s nothing more to it. And precisely because of this the place has it all: authenticity. The wind and sand are morse respectful here. 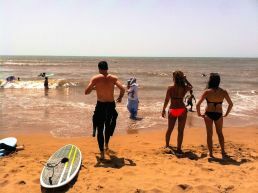 Sidi Kaouki is a paradise for surf and windsurf lovers. The waves in the water and the wind gusts are the perfect allies to put in practice their aquatic passions. Waves are one of the main attractions in the Moroccan Coast. I couldn’t imagine a better way to close this trip than to tour with a quad the roads of sand, rocks and palm trees near Marrakech. Nothing like going by camel: this is really a worth it. Furthermore, it represents a won pulse to the hagglers: we payed half of what they asked. The air spits fire and speed doesn’t make it any better. But the body hangs on, there’s no alternative. Marrakech is a true hell in August but it still preserves a great deal of its charm. After the sandy curves, a bit of tranquility to close the day that bids farewell to the trip. When the sun sets again, we’ll be back home.